29 years ago - Leslie Willis is born. 10 years ago - 19-year-old Leslie becomes a radio DJ on an underpowered station. 5 years ago - 24-year-old Leslie speaks out aggressively against Superman after his return, and begins to attain national attention. 4 years ago - 25-year-old Leslie stages a concert to disrupt the cleanup of Metropolis after the Parademon attack. She is struck by an energy discharge from an dieing Father Box. She becomes Livewire, and begins to attack Superman until he's able to capture her. 1 year ago - 28-year-old Leslie is freed by Gorilla Grodd to join the Legion of Doom. 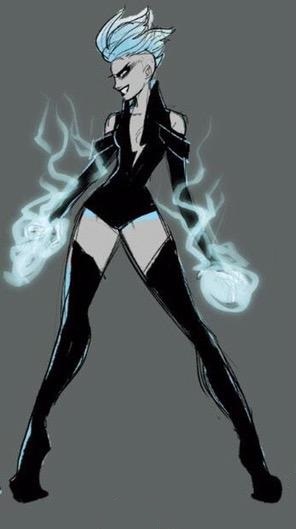 Livewire was created for the Superman Animated Series before she transitioned into the comics. Superman lends himself to having some really innovative enemies, and when they're well done they become benchmark characters that are used across the DC Universe. Livewire is powerful enough to challenge even the toughest characers, but she's such an unpredicitably human character that she also poses a pretty accessable challenge even to more grouded, powerless heroes, That sort of versatility makes her a fantastic character, and it's always exciting to see her used. The creators of the Superman Animated Series needed a few more baddie options for Superman to have to deal with, since a lot of his classic enemies are old white guys in suits. He really didn't have a lot of female villains (Maxima notwithstanding) and they had a lot of sucess with original character Harley Quinn over in the Batman series, so it made a lot of sense for them to invent a brand new female enemy. Livewire is a classic Bruce Timm/Paul Dini creation, a puck-like agent of living electricity chaos. She transitioned into the comics, because shes' a great character and deserved to be there, but she was such a clean, uncomplicated concept that she was basically set up to be underutilized and overcomplicated once she hit the comics page. She actually wound up wearing the containment suit once worn by blue electricity Superman, which just seemed like a odd thing to try to bring back. Later still, she was actually turning over a new leaf and becoming more of an ally to Superman. Sometimes when you have a really well-liked character they wind up becoming more of an anti-hero, but Livewire really doesn't quite click unless she's a completely chaotic consequence-free character. Much later she was brought back in the pages of Cameron Stewart & Brandon Fletcher's Batgirl, where fantastic artist Babs Tarr got to redesign her look and make her awesome all over again. When Livewire was invented making her a shock jock was actually a pretty topical origin. It's a dated reference now, but rather than try to give her a different backstory, we chose to keep it the same but associate it more deliberately with Superman. Instead of just being a generic agitator, we've suggested that she actually gained her noteriety by speaking out against Superman after his death. There's often a suggestion in Superman stories that there are people that use him as a scapegoat for the world's problems, and this particular era, where the world just suffered through the loss of Superman and suddenly he's back just seems like it would engender this sort of animosity, and Leslie seems like just the person to do it. Moving on, the regular origin is simply that Leslie is struck by lightning while touching Superman, but that's a bit of a elaboration on the nature of Superman's physiology. We shifted it to instead be the result of New God energy, which is more traditionally otherworldly. She's a young character, so there really isn't any need to cram more adventures for her in, she's definitely going to have many more in the future. The character designs done by the Batman and Superman Animated Series, and then later the Justice League and Justice League Unlimited, are instantly recognizeable, and you're probably hard pressed to find any other singular design aesthetic that's had a broader-reaching influence on DC, or on comics in general. Livewire is an original character made for the show, so she's very emblematic of that style. It's a very clean, simple design, but it's also manages to simultaneously be very sexual without being sexualized. Every time you see the character drawn in regular comics where they are aiming for a slightly higher level of realism it suddenly becomes almost gratuitous... although I'd argue that it somehow still seems to work simply because it all comes from that original clean design. All that said, Babs Tarr's work when she redesigned the character for her appearance in Batgirl is just perfect. If there's ever been a characrer that more deserves to be sporting a mohawk I don't know who it is, but it goes beyond that into every little facet of the new look. Bab's pages where she tried different looks and costumes for Livewire are so much fun to check out; sometimes a certain artist and a certain character fit together in a perfect way. The final look that turned up in the comic featured a sort of seperate shoulder pad design, which was cool, but the look we've included here was from her try-out pages, giving her a slightly higher collar and exposed shoulders. That look, if you ask us, is absolutely perfect. We've made Livewire a young addition of Superman's enemies, having first gained her powers a mere four years ago. We brought her into Grodd's Legion of Doom, because she really does feel like the next generation of supervillain and we want to give her that platform. Moving forward, as Superman dials back his involvement to raise his son, Livewire's rise in prevelence coincides perfectly with Supergirl's new place as the main Kryptonian hero of Earth. Does it seem a little on the nose to make Superman's main female baddie an enemy for Supergirl? Maybe a little, but it also just feels so fantastically perfect. There are a lot of new, young heroes that are coming up, and Livewire just feels like THE character for them to have to fight.